It's said that you can lead a horse to water but you can't make him drink. So when Ron Krajewski first introduced his horse, Metro, to an easel there was no guarantee he would paint. After all, this horse had been struggling with health problems since he was adopted by Ron and his wife in 2009. Metro had once been a successful racehorse - as Metro Meteor, he won eight races and $300,000 (£234,000) prize money at the prestigious Belmont Park. However, he was retired by his stable after bone chips in his knees caused permanent damage. "We were looking for a horse Wendy could ride and were probably quite naive," Ron says. "We soon discovered Metro had worse race injuries than we had bargained for." Metro had months of rehab and medication. Special horse shoes helped for a time, but in 2012 X-rays revealed his knee joints were closing up. A vet said they would lock up within two years, at which point Ron and Wendy would have to put their horse down. "I didn't just want to put him out to pasture and forget about him. I was thinking about how we could spend time together," Ron says. He had noticed that his spirited horse liked to bob his head to get attention and pick things up in his mouth. A professional artist himself, Ron wondered if he could convince Metro to hold a paintbrush. 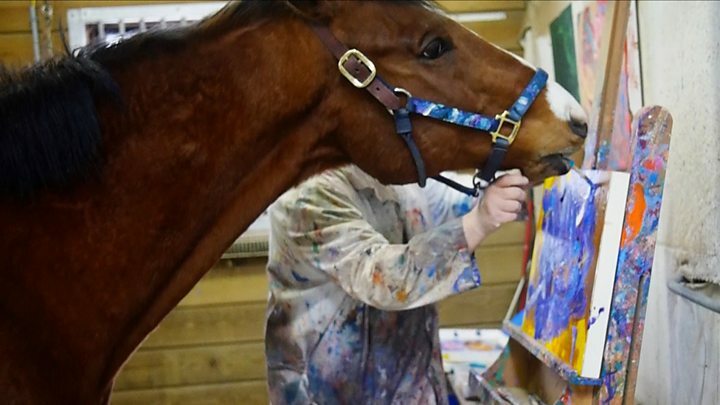 "I taught him to touch his nose to the canvas for horse treats, then to hold a paint brush," Ron says. "He could have just touched the paint brush to the canvas and then dropped it and that would have been the end of it. Luckily for us he started making up and down strokes and seemed to enjoy it." Metro was soon creating works that Ron judged were good enough to put on sale at a local gallery. The first four paintings sold out the week they were put on display. Metro's unbridled style has been compared to Jackson Pollock, a painter famous for his splatter and drip technique. "Metro's brush strokes are nothing a human can make, because he doesn't think about what he will do before he does it. His strokes are thick, random and sometimes broken, which lets other colours show through. It all just vibrates on the canvas," Ron says. Metro's unusual ability caught the attention of local TV news in Gettysburg, Pennsylvania, and his story was picked up nationwide. By 2014, there were 150 people on a waiting list for his works. Sales of the paintings helped fund a new experimental treatment for Metro. His vet created a technique to apply a drug called Tildren directly to his knees. "Within a few months X-rays showed the bone growth had receded. It has added years to his life," Ron says. Ron and Wendy keep Metro and their other horse, Pork Chop, at a stable four miles from their home. They visit them about five days a week and on two of those Ron and Metro have a painting session. "Metro has got a little section in the barn that we call his studio. It's all set up ready for him to paint," Ron says. "I did try to get Pork Chop to paint once, but he just wasn't interested." Ron acts as both art director and assistant. He picks the colour and loads the paintbrush before handing it over. Metro then makes the strokes. "I always stand on his left so he paints from left to right. If I hand him the brush in the upper right hand corner, that's where he will go." Ron and Metro will work on three or four canvases at once during a 20-minute session. "We'll spend two minutes on one canvas and then swap it for another. He tends to smear things together so we'll do some blues and then let it dry, then let's say some orange. This builds up the layers." Metro, who Ron says has an "A-list extroverted personality", is in his element at the easel. "I can put out the easel in the field and he will stop eating grass and stand right in front of it. "He loves to paint. I'm not sure how much he can see as horses have a blind spot right in front of their noses. I think he likes the feel of running a brush over the canvas." Like Metro, art wasn't Ron's first vocation. Raised in a fishing family that caught salmon in Alaska he went on to serve in the US Air Force. He became a professional artist at the age of 40. "I mainly do pet portraits, which are very lifelike and controlled. When I paint with Metro it's the opposite. You can't predict what he's going to do when he gets the brush in his mouth. It's controlled chaos." Metro's paintings continue to sell well. "We have different sizes that vary in price from $50 to $500. We're selling one or two a week," Ron says. Ron and Wendy donate half of Metro's earnings to a charity called New Vocations, which retrains and rehomes former race horses. So far they have donated $80,000 (£62,000), which will have helped 50 to 60 other horses. And now aged 14, it seems Metro has no inclination to slow down. "There's something about painting which really interests Metro," Ron says. "I don't think he'll ever get tired of it."